Why should you book with us! We have no hidden fees and vehicle damage insurance and theft insurance are included. We co-operate with Avis, Hertz, Europcar, Budget, Sixt, Thrifty, National, Alamo, Enterprise, Keddy By Europcar, InterRent, Dollar, Firefly, Flizzr, Goldcar, Surprice, Rhodium, Hertz Dream Collection, Autoclick and King rent etc. in Spain. It is often cheaper to book online than it is to book by making a phone call. You can also book one-way with one-way rental abroad. Rent a Car Cheap in Spain with unlimited mileage, all obligatory insurances, taxes and fees. We compare 50 rental companies in Spain. In our prices free miles, unlimited mileage, all obligatory insurances taxes and fees are included. Like Claims - Limitation of Damage, Third Party Insurance, Theft Insurance, Taxes, Airport Fees, Placement Fee, Kilometre Charges, Accident Help Fee. Compare car hire for a day, long term, one year, a whole month, week, weekend or for as many days as you wish in Spain. Search, find, compare and book your car rental in Spain for less. It is possible to rent a car for one way, called the one way rental in Spain. You collect the car in one place and return it somewhere else, e.g. another city or country. Compare car rental for a week, one month, one day, number of days you wish, long-term, a weekend or a year. Compare many companies and sites to find the best price. Autospain.co.uk compares one way rental from several companies in one search. We compare prices from different companies like Budget, Hertz Dream Collection, Keddy By Europcar, Sixt, Cooltra Scooter, CICAR, Wiber, Solmar, Marbesol, Hertz, TopCar, Firefly, AutoReisen, Atesa, Orcar Canarias, Owners Cars, Centauro, Enterprise, Drivalia, National, King rent, InterRent, Canarias.com, Thrifty, Flizzr, Avis, Goldcar, Record, Autos Menorca, Delpaso, Europcar, Class Rent a Car, Faycan, OK Rent a Car, Surprice, ClickRent, Orlando, Autos Valls, Rhodium, Dickmanns, La Palma 24, Maggiore, Autoclick, Hiper Rent a car, Nomadcar, Niza, Alamo, Malco Rent a Car, Dollar and Autos Aguirre etc. in Spain. This year, Tarragona Port will receive 40 cruises and 40,000 passengers. Welcome to autospain.co.uk! Here you can compare prices on car hire in Spain. One tip on how to find the cheapest price is to book as early as possible. We recommend to book 2-4 months in advance, if possible. When you rent a car from us, no surprise awaits you when you pick up the car on your arrival. Our prices include free mileage, airport fees, free miles, road assistance and obligatory insurances, taxes and fees. Search for your desired pickup location in Spain and pickup date in our car hire search engine. Compare in a simple overview. 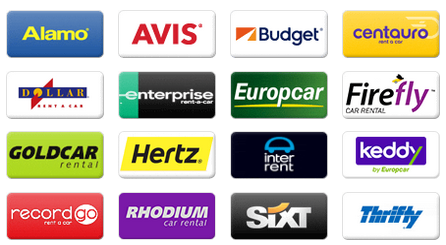 You can compare all companies, available rental cars, the different terms and the price. Book the car hire deal of your choice online to save money. Book your rental car safe and secure at autospain.co.uk to ensure yourself of a carefree holiday. Because of our large volumes we offer cheaper rental cars than if you would book them directly at the car hire company. All reservations include standard insurances. With us you have the option to cancel for free up to 24 hours before your pickup. There are many different models and sizes of cars to choose from. Fleet list in Spain: Estate (Estate), 9 seat minivan / Minibus (9 seat minivan), Minivan (Minivan), Intermediate (Intermediate), Economy (Economy), Premium (Premium), Fullsize (Fullsize), Mini (Mini), Moped (Moped), Standard (Standard), 5 seat minivan (5 seat minivan), Compact (Compact), Convertible (Convertible), SUV / Jeep (SUV), 7 seat minivan (7 seat minivan), Luxury (Luxury), Cargo van (Cargo van). Big cities and popular destinations have more car types to choose from. If you want to rent a luxury car then search at the major airports and the most popular destinations in the major regions such as Murcia, Canary Islands, Castille and León, Castille-La Mancha, Andalusia, Madrid, Galicia, Catalonia, Basque Country, Valencia etc. It can also be harder to find and book special cars during peak season, if you do not search well in advance, before you need your rental car. Cars you can rent in Spain are e.g. Mini: e.g. Mini Cooper S, Volkswagen Up, Peugeot 107, Fiat 500, etc. Economy: e.g. Fiat Panda, Volkswagen Polo, Smart Forfour, Opel Corsa, etc. Compact: e.g. Nissan Leaf Electric, Hyundai i30, Toyota Auris Hybrid, Citroen C4 Cactus, etc. Intermediate: e.g. Citroen C5, Audi A3, Toyota Avensis, Mercedes A Class, etc. Standard: e.g. Volkswagen Passat, Opel Insignia, Audi A4, etc. Fullsize: e.g. Mercedes E Class, Mercedes C Class, BMW 3 Series, etc. Luxury: e.g. Porsche Panamera Turbo S, Porsche Panamera, Audi R8, McLaren MP4 12C, etc. Premium: e.g. Mercedes C220 CDI, BMW M4 Coupe, Fiat 500 Abarth, Mercedes E280 CDI, etc. Minivan: e.g. Mercedes Vito, Volkswagen Sharan, Mercedes Viano, etc. Cargo van: e.g. Volkswagen Transporter Cargo Van, Ford Transit LWB, Mercedes Sprinter, Volkswagen Crafter Cargo Van (11m3), etc. Moped: e.g. Scooter 125cc Electric, Scooter 125cc, Scooter 50cc, Scooter 110cc, etc. Convertible: e.g. Mercedes SL, Audi TT Convertible, Mini Cooper S Convertible, Opel Astra Convertible, etc. Estate: e.g. Skoda Octavia Estate, Renault Clio Estate, Volkswagen Passat Estate, Skoda Fabia Estate, etc. 5 seat minivan: e.g. Renault Scenic, Citroen Berlingo, Ford C-Max, BMW 2 Series Active Tourer, etc. 7 seat minivan: e.g. Ford Galaxy, Volkswagen Touran, Renault Espace, Citroen C4 Grand Picasso, etc. 9 seat minivan / Minibus: e.g. Mercedes Vito, Mercedes Vito Traveliner, Fiat Scudo, etc. SUV / Jeep: e.g. Range Rover Evoque, Daihatsu Terios, Jeep Renegade, Toyota Rav4, etc. However, in smaller cities and on islands like Lanzarote, La Palma, Minorca, Ibiza, Majorca, Fuerteventura, Tenerife, Formentera, La Gomera, Gran Canaria etc, the range is smaller. We, autospain.co.uk, have 24/7 customer service and it is available all year round at all times of the day and night. If you need help with your booking or have encountered any problems with your car hire, please do not hesitate to contact us. A member of our team will be happy to help with any questions. Our aim is to make it as easy and effortless as possible to find a rental car according to your wishes. We do not own any cars ourselves, we only compare prices between different companies such as Maggiore, Autos Aguirre, InterRent, Hertz, Class Rent a Car, Nomadcar, Alamo, AutoReisen, Delpaso, Goldcar, Autos Menorca, Owners Cars, King rent, Malco Rent a Car, Flizzr, Solmar, Firefly, Avis, Drivalia, OK Rent a Car, Canarias.com, TopCar, Cooltra Scooter, Europcar, Surprice, La Palma 24, Dollar, Orcar Canarias, Record, Enterprise, Thrifty, Dickmanns, Marbesol, Rhodium, Centauro, ClickRent, Keddy By Europcar, Faycan, Niza, CICAR, Autoclick, Sixt, Hertz Dream Collection, National, Hiper Rent a car, Orlando, Autos Valls, Budget and Atesa etc. in Spain. When you have rented a car from a company you collect it from that company. Through autospain.co.uk you can easily and quickly amend your booking or cancel it. Please leave a review on our search engine for rental cars in Spain. Our goal is to create the best comparison page for finding cheap car hire in Spain. We update all the information all the time and add new car rental companies in cities like Seville, Bilbao, Barcelona, Málaga, Valencia, Murcia, Madrid, Palma de Mallorca, Alicante, Valladolid, Cordova, Las Palmas de Gran Canaria, Zaragoza etc. as well as new features and tools continuously. Hope you like our site! What do you think of autospain.co.uk? Do you find what you are looking for?